◇Humanized design with easy disassembly, product contact part can be separated for cleaning without tools, leaving no corner, particularly suitable for food field. Time and energy saving, it takes one man only one minute to complete the whole dismantlement without tools, much more safe and efficient. ◇Hopper with arch broken device to help you to solve bridge issue. ◇Upgrade components: Polished screw, Semi-open tube. ◇Besides standard type for your choice, it also can be customized based on your requirements. ◇Matched with many packing equipments for powder or granule products. ◇Widely applied in milk powder,sugar,coffee, starch, additives, dextrose, monosodium glutamate,etc. 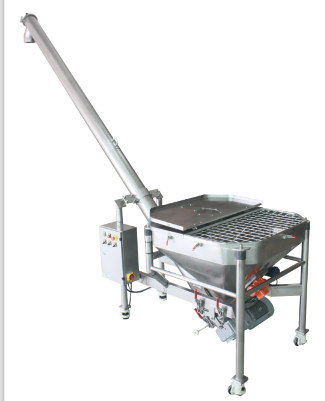 ◇Standard Control Box ◇Safety Net ◇Vibration Sieve ◇Hopper Cover ◇Dust Cover ◇ Blender for Anti-bridge.